As an event planner, one of the most common components you’ll need to consider is your catering team. Although when you’re organising events you’ll often find that the venues you book will have in-house catering teams, there will often be choices and you may be able to bring your own team in. Of course many events will be held in venues that do not supply catering – it depends what kind of events business you’re considering setting up. If you’re going into the wedding game, for example, you’ll find many of your events will be held in marquees or in private venues. In that case you’ll need to be able to offer your clients peace of mind knowing that you have great caterers on board. It might be that you are putting together an event in a space that does not offer an in house team – it might not even have kitchens! You’ll need to be able to rely on your catering team or teams to be able to deal with whatever situation arises. Assuming you’re not going to be putting together a catering events company, it’s best to find a team that you can work with easily. Identify the kind of catering you’re most likely to need for your events and start by looking for the kind of caterers that service those needs. Will you have a large requirement for outdoor events, for example? 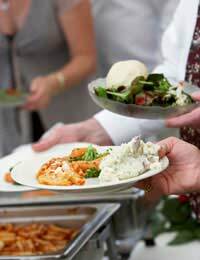 You’ll need a caterer that’s used to operating outdoors in catering tents with mobile units. Will you have lots of canapé receptions? This kind of catering can often be supplied by a specialist. It could be that you end up working with more than one company as you find different caterers will specialise in different types of events. Ask around for recommendations, and look on the net for ideas. Check with venues that you already work with as they often have a list of preferred catering suppliers and they’ll have vetted them before taking them on. Once you have some catering companies you’d like to look at further, set up a meeting. See if you like each other first! Do you work the same way? Have the same attitude towards the client? It’s important that you know you can trust each other to be supportive and react in similar ways to event planning situations. Are they flexible, easy to work with? Have a look at some menus, ask to see evidence of previous events. Go and see their premises, and very importantly, get to meet some of the service team as well. It’s all very well having great food, but if it’s served badly, it can taste like heaven – all your guests will remember is how rude the waiter was!